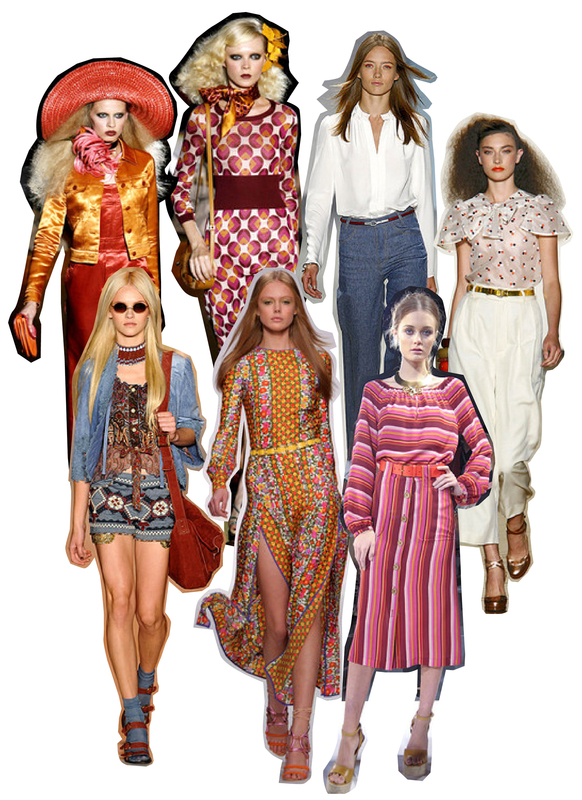 Recent fashion seasons have showcased vintage inspired designs from eighties-punk to fifties prom, so it was inevitable that 1970s inspired fashion would make a come back and it seems that Spring/Summer 2011 is it’s time to shine. Along with bright colours and patterns across many fashion labels, many RTW items in S/S collections were 1970s chic with a 2011 twist. Top L-R: Marc Jacobs, Marc Jacobs, Derek Lam, Marc by Marc Jacobs. Bottom L-R: Anna Sui, Aquilano e Rimondi, Tory Burch. Marc Jacobs used stunning hues of oranges, yellow and reds and patterns iconic of the decade to create 70’s glamour worthy of Studio 54. Other designers channeled 1970s hippy chic in their collections. Accessories are a big part of this trend, for Marc Jacobs, it’s statement hats and coloured neck scarves. I am loving Anna Sui’s Tan-leather bags and seventies shades! Obviously, if money was no option, I’d buy all of the things, but for now I’ll just have to admire these clothes from a distance! On the bright side, the high street seems to be catching on to this trend and seventies-chic fashion is popping up in Spring/Summer ranges in most of them. In my trend-hunting, I found some lovely recessionista-friendly takes on the trend. River Island seems to have the nicest range from their Seventies Girl collection. I am loving that brown satchel bag! What I love most about this trend, is that simple accessories can transform the look and there are lots of nice things to choose from in the shops right now! 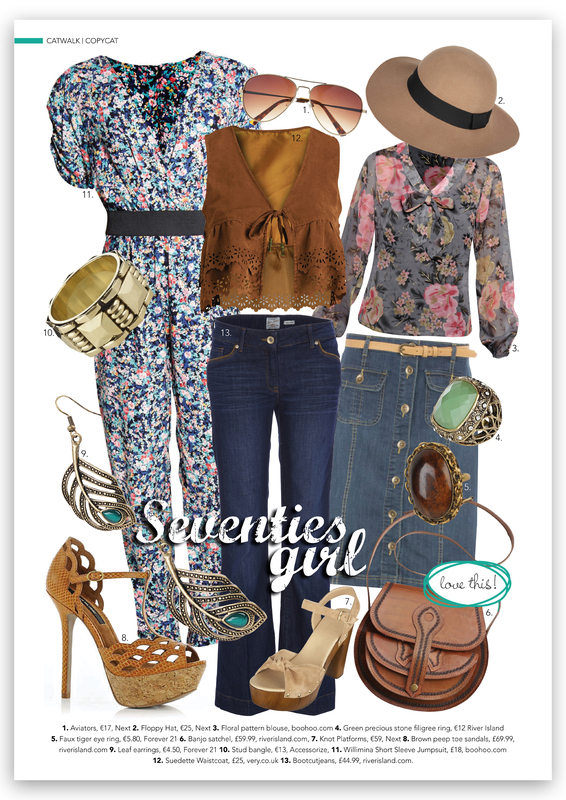 This entry was posted in Top from the shops, Trend Hunter, Uncategorized and tagged 1970s fashion, 70's glam, accessorize, Aquilano e Rimondi, aviators, banjo satchel, boohoo.com, bootleg jeans, Derek Lam, forever 21, gold bagle, hippy-chic, Marc by Marc Jacobs. Bottom L-R: Anna Sui, marc jacobs, next, river island, shoes, studio 54, Tory Burch, very.co.uk. Bookmark the permalink.